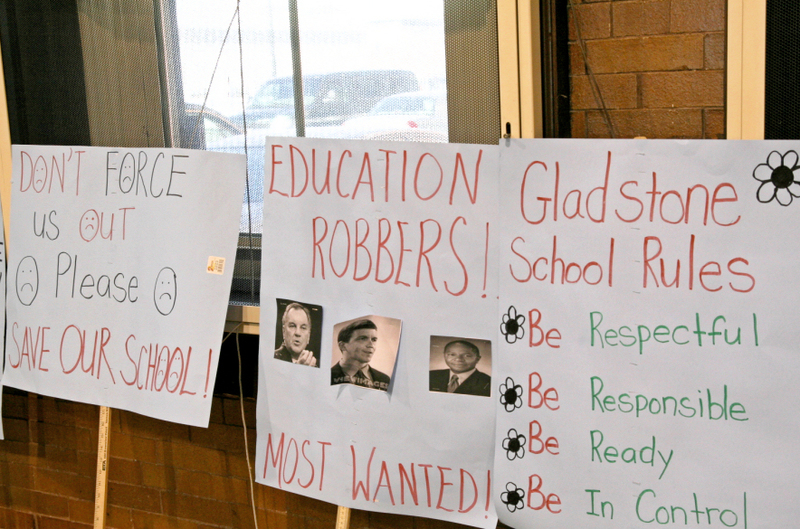 Everyone at a CPS community forum in the spring of 2009 opposed the closing of Gladstone elementary with 300 students. Mike Milkie crosses a picket line at Gladstone Elementary. Photo by David VanceNoble officials crossed the student picket line, including former CEO of Noble, Mike Milkie. 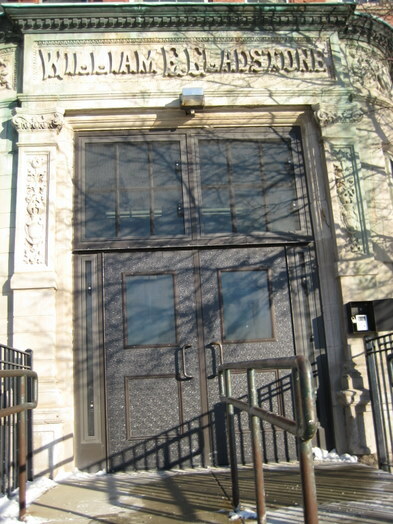 Gladstone elementary, 1231 S Damen Ave., was closed in 2009, despite widespread opposition, and the building given to Noble charter.After 100 years of education history, Gladstone is gone. Another public building given to a private operator. 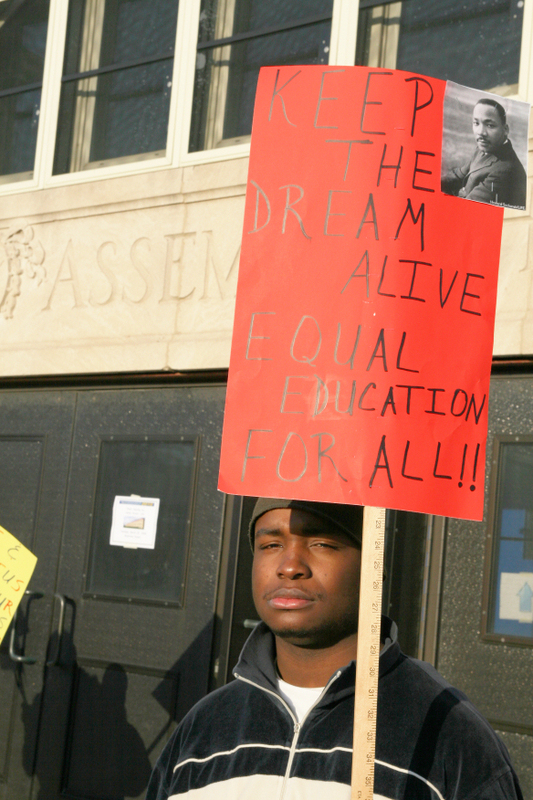 School community members, from more than 50 Chicago public schools, opposed the board of eduction's closures and charter school replacements in the 2000s. Gladstone protested in 2009 as Noble took over. There are now 56 charter elementary schools and 65 charter high schools in Chicago. The outgoing head of Chicago’s largest and top-performing charter school network is being investigated following allegations of inappropriate behavior toward young female alumnae, WBEZ has learned. In a statement, Mike Milkie acknowledged he “acted inappropriately toward adult women affiliated with Noble.” He said that is why he announced his retirement last week as CEO of Noble Network of Charter Schools. “This is why I am rightly no longer CEO,” Milkie said. “ I am very sorry and apologize first to those impacted by my inappropriate interactions. I also apologize to my family and to my friends. I let you down. Finally, I apologize to the students, alumni, families, and supporters of Noble. I let you down, too.” Noble runs 17 charter high schools and one middle school that serve more than 12,000 students. Many Noble campuses are high performing and viewed as models of success. The charter network is also a darling of the city’s rich and powerful, with campuses bearing such names as Rauner, Pritzker and Chicago Bulls. 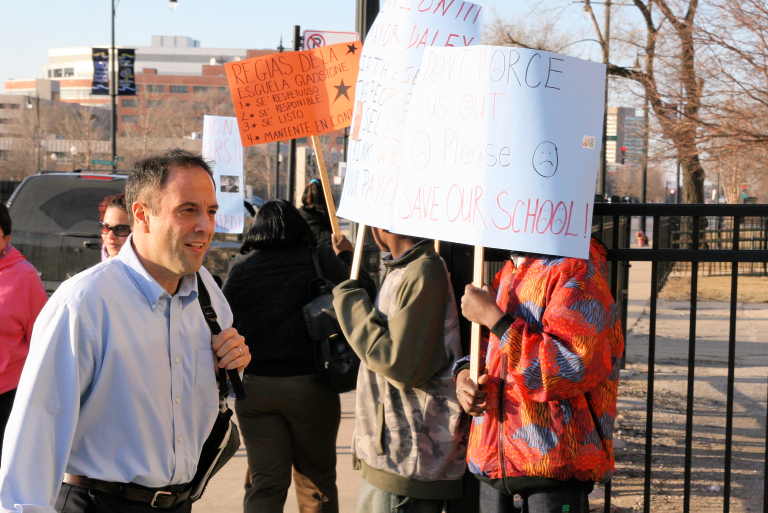 On Tuesday, Noble Board President Allan Muchin confirmed to WBEZ that the board was investigating Milkie, 57. The board has hired an outside law firm to conduct the investigation of Milkie. The board was notified after two top Noble leaders, then-president and now CEO Constance Jones, and Head of Schools Ellen Metz, confronted Milkie in October. They cited “a pattern of inappropriate behavior across several incidents, including hand holding and slow dancing with an alumna,” according to a statement released by the charter network. The two leaders said they lacked confidence in Milkie’s leadership. When faced with this information, Milkie chose to retire, the statement said. “At no point did Noble leadership have knowledge of allegations that required mandated reporting, nor that were criminal in nature,” Noble said in the statement. Noble also said the outside law firm will review the charter network's reporting processes for allegations of inappropriate behavior. Gladstone community signs in 2009. WBEZ interviewed one alumna who said Milkie used his powerful position several years ago to put her in a terrible situation. She was in her early 20s, and just out of college, when she was asked to chaperone a college trip Milkie was taking with a handful of current Noble students. After having dinner with students, he took her into the college town and they went to a bar. She said he pushed her to drink, despite several refusals. She said she then left to go back to the hotel and, on the way back, he held her hand. She was so afraid of Milkie that she barricaded herself in her room and called her boyfriend to pick her up. The young woman had plans to become a teacher, working under Milkie at one of the Noble campuses. Once back in Chicago, she said Milkie called and texted her incessantly until she finally answered and told him to stop. The Noble graduate said she shared her harrowing story with the Noble staffer who hired her to chaperone the college visit. She doesn’t know what, if anything, came of her complaint. A senior Noble staff member told WBEZ about allegations against Milkie as well. When this staffer was principal at a Noble campus, female students told a teacher Milkie made them feel uncomfortable, she said. The students said Milkie paid girls more attention than boys and took a personal interest in their lives. The principal looked into the allegations and concluded they didn’t rise to a level that further action was required. This Noble staffer also requested anonymity by WBEZ. A third woman connected to Noble — another recent graduate — described to WBEZ efforts by Milkie to forge a relationship with her when she was a student. He never crossed a line, the 2015 graduate said, but his repeated efforts to seek her out at lunchtime, to take her on college trips, to babysit his children, made her feel targeted and uncomfortable. Muchin said it was important for the board to take action. “When you have someone running schools, you have to take these situations seriously,” he said. Muchin did not want to discuss what steps the board may take if the investigation turns up serious wrongdoing. WBEZ reporter Linda Lutton contributed to this story. Unfortunately, these pedophiles lurk around our children. Imagine -- inviting your prey to babysit your kids while your wife's away -- thats sick. Amazed this man isn't in prison. Most people defend themselves. This guy is so guilty of the things yet to be revealed he went into hiding. Coach Sandusky is doing 30-60 years for this kind of behavior. I'm sure more victims will need to come out into the open to put this kind of person away. The fact he blatantly admitted to fact and went into hiding should ring some serious alarm bells here.